However, I doubt a concept quite like Pierre Audi´s has ever been conceived before. The sets by George Tsypin are simply breathtaking as well as highly original, making use of wood, stone, glass and metal to create vast and virtually endless spaces while placing the orchestra fully visible in the pit. The action takes place on a semi-abstract sparsely decorated symbolically Ring-shaped stage surrounding the orchestra. Keywords of this minimalistic staging are aesthetism, contrasting colours and lights. Key themes are light and darkness with sets build from ramps and platforms surrounding the orchestra. Everything, including the perfect scene changes, takes place under full view of the audience as no stage curtains are used. Stage lights are used with a virtually unseen sophistication revealing the seemingly endless structural layers and spaces of the sets. For these reasons the most epic of the operas – Rheingold and Götterdämmerung work best. Academy Award-winner Eiko Ishioka´s eclectic costumes come with inspirations ranging from Spiderman to Burmese villagers: We are in a timeless, abstract universe, futuristic in the layout, but with elements from the fantasy genre as well the magical world. In this universe everything is possible. You never know what/who may appear around the corner. Characters meet at the crossroads of time where figures of the past and present present themselves – from Mesopotamian clay figures and Keltic priests to Arab women and green insects. In the one-hour documentary, The Forging of the Ring the creation of this production is discussed in detail. The overall impression: Devastatingly beautiful and entirely unique succeeding in capturing the epic and mythical as well as eternal aspects of the Nibelungen Ring. Unfortunately… the musical aspects of this Cycle do not live up to the staging. Worst of all is the lack of stage chemistry between most of the major protagonists, several of whom are mediocre or worse, vocally as well. With the right conductor and cast this Ring could be unforgettable. It still is, but so much more could be achieved by raising the level of some of the key performances. This production may not be fully appreciated on DVD, but I do not question the impact these huge spatial structures must have had on the audience in the theater. DVD viewers wanting to “see the production as if present the audience” may find themselves in trouble: The odd camera angles makes it virtually impossible to grasp the orientation of the sets. Compared to the other Nibelungen Ring DVDs, the staging sets it apart from the others. However, an over-all assessment places it far behind both the Kupfer-Barenboim and Chéreau-Boulez´ Bayreuth productions, mainly due to the inferior musical quality. Regarding the others (Metropolitan Opera, Copenhagen Ring, Stuttgart Ring, Barcelona Ring) the choice will depend (to a higher degree) on personal preferences regarding type of staging, style of conductor, importance of the drama/voice ratio etc. An overview of the available Nibelungen Ring DVDs may be found here. One visually stunning image is replaced with the next even more stunning image: The abstract golden images of Nibelheim, complete with smoke in the background and carts on fire. The golden cubicles scattered around an otherwise empty stage. The African-inspired metal-bridge looming over the golden rocks. A naked light bulb popping up with varying intervals (throughout the cycle). The Gods are from Star Wars. Fasolt and Fafner are clay figures from Mesopotamia. Mime is a green insect. The colours are combinations of red, black, white, green. Erda is half-black, half-white. As the epic spaces and mythologic presence counts for much in Rheingold, one may almost get away with a less than ideal casting, both vocally and dramatically. Which they seem to have taken advantages of in this production as none of the cast is particularly memorable. When only Mime (Graham Clark) delivers a first-rate performance, there is room for improvement..
We are now on the circular Rings of Saturn, which surround the orchestra pit. A small black house is located just behind the Rings and the reappering naked light bulb..
Sieglinde looks like an Arab woman, Wotan is a Keltish priest. Fricka is just white and old. Brünnhilde is an old witch. Walküre is the least successful of the four operas, as a successful Walküre depends on the exact quality this Audi Ring lacks: Interpersonal drama. As much of the opera consists of two-person confrontations in chamber-opera environments of confined spaces, the scenery obviously takes second place. The lack of engaged dramatic interaction is simply appalling and furthermore the cast is not first-rate overall, neither vocally or dramatically. Kurt Rydl is better as the more energetic Hagen than as Hunding. Nadine Secunde is rather bleak and shrill as Sieglinde, but stil compares favorably to John Keyes plainly uninteresting Siegmund. Jeannine Altmeyer has the right flow of a Brünnhilde. Unfortunately she is flat throughout and is made up to look like an old witch. John Bröcheler is simply disappointing as a dry Wotan with an anonymous appearance. Mime is a hyperactive demented green insect, continually rushing about on the virtually empty stage, save a bed. In a rather effective twist, the Wanderer is represented by an omnipresent watching television eye (he sings from the side stage). Act One concludes with a mightily impressive real fire in the forging scene, which no doubt would not have been allowed in the US for contractual reasons. In one of the best scenes, the Wanderer and Alberich appear as reflections of each other in Black (W) and brown-golden (A). Fafner, the ancient Mesopotanian clay sculpture from Rheingold appears within a dazzling green-red light show. Siegfried is the only character wearing normal human clothes – perhaps he is the only real person, as opposed to the others, who represent ideas? A whiteclad boy with a strange hat helps Siegfried. He is the Woodbird. Erda reappears half-and-half: Half white-half black dress, half white – half black hair, half Goddess – half human. Heinz Kruse is vocally unexceptional as Siegfried and even worse dramatically, with stiff movements and entirely unconvincing looks. There is absolutely no chemistry between him and Jeannine Altmeyer´s Brünnhilde. Graham Clark almost exaggerates the interpretation as well as the sprech-gesang, but is nevertheless a great Mime. The Woodbird is a charming boy’s voice. Henk Smit is rather unsteady and rough as Alberich and John Bröcheler is not better as Wanderer than Wotan. Gunther and Gutrune are semi-roccoco figures. Gutrune, the veiled Arab women presents Siegfried (an escapee from a samurai movie?) with the drink. Kurt Rydl´s Hagen is fantastically energetic, bare-chested and bald in black outfit. 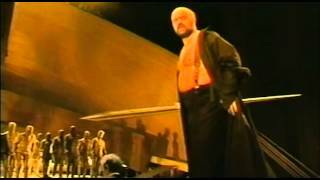 And the always problematic Tarnhelm scene was managed rather effectively: We simply see both Siegfried and Gunther on the stage simultaneously, Siegfried takes the Ring – Gunther goes with Brünnhilde. Idiomatic for this cycle, the (lack of) acting and interpersonal drama is the major weakness. The only engaging performance is Kurt Rydl´s Hagen. If one may ignore his almost intolerably shaky voice. Jeannine Altmeyer as Brünnhilde sings well with almost no vibrato and the right flow to the part, but she has a tendency to be flat. Much worse is the insistence on the part of the director to make her look awful beyond description… Heinz Kruse´s unengaging Siegfried is well-known from the preceding evening. Wotan: John Bröcheler is a local audience favourite, but unfortunately makes a rather weak and dry-voiced Wotan, not helped by his uninteresting stage presence. Fricka: Reinhild Runkel is not a particularly strong Fricka, not helped by her Sumo Wrestler look (made by the director). Alberich: Henk Smit wasn´t exceptional, neither was he grossly inadequate. Fasolt: Solid performance from Peter Mikulás. Fafner: Solid performance from Carsten Stabell. Mime: Graham Clark was the center of all his scenes. Some may find he exaggerates the sprechgesang and is too energetic, but he brings some much-needed life to his scenes. Sieglinde: Nadine Secunde was much better for Barenboim in Bayreuth. Here she is voally weak with a disturbing vibrato and a shrill voice. Siegmund: Not a good performance from a wobbly and stiff John Keyes. Hunding/Hagen: Kurt Rydl is fabulously energetic, which goes a long way to make up for his shaky voice and wobbly intonation. Of the two, his Hagen is the most impressive. Whatever one may think of his voice, he is never boring. Brünnhilde: Jeannine Altmeyer is doing much right: Her Brünnhilde has the right flow and dramatic presence. Unfortunately she looks (is made to look) like a witch throughout. And has a tendency to sing flat. Erda/Waltraute: Anne Gjevang´s voice is not beautiful, and a heavy vibrato as well as pitch problems in the upper register resulted in rather weak interpretations of both Erda and Waltraute in a DVD field where competition is stiff (Birgitta Svendén, Waltraud Meier, Anette Bod, Hanna Schwarz). Gutrune: Eva-Maria Bundschuh was shrill and uninteresting and clearly past her prime with Barenboim 7 years earlier. Hartmut Haenchen is a baroque specialist and a stickler for authenticity. For this Nibelungen Ring he chose the Neue Richard-Wagner Gesamtausgabe incorporating notes and suggestions [from Richard Wagner] as written down by his assistants while rehearsing the operas in Bayreuth. As expected, Haenchen has been extraordinarily thorough in his reseach to accomodate Wagner´s wishes in choice of tempi etc. Some feel that Haenchen has brought clarity and greater transparencly to the work. I ultimately feel that it is too monotonous. Tension is lacking. Tempi are too fast. And upon repeated listening: It´s superficial and uninteresting, failing to reveal the dephts of the score or the deeper structures of the work. It cannot be blamed on the Rotterdam Philharmonic Orchestra, clearly is a fine orchestra. Compared to the available Ring DVDs, Haenchen falls far behind Daniel Barenboim. Also James Levine´s at times monotonous smoothness is preferable to Haenchen´s. As is Michael Schönwandt´s Copenhagen Ring. And Pierre Boulez Centenary Ring in Bayreuth. I´d even rate Zagrosek in Stuttgart above Haenchen. But not Bertrand de Billy´s disappointing Barcelona performance. The lowlights: The weak casting of several of the lead singers. The lack of interpersonal drama. La mise en scène de Pierre Audi est très datée année 1960, marquée par un pseudo modernisme japonisant, bien peu esthétique finalement, quoique parfois très efficace: le choeur des 8 Walkyries au début du III (mi abeilles guerrières mi séraphins affublés d’une paire d’ailes fixes argentées), bientôt rejointes par leur 9è sœur, la brave et traîtresse à son père: Brünnhilde. La vedette reste vocalement le percutant et terrifiant Hunding de Kurt Rydl: œil noir et silhouette de corbeau du samouraï prêt à rugir et à bondir. Le plateau circulaire, avec l’orchestre à droite, conduit au coeur de l’action et les caméras, s’il n’étaient les micros parfois placés trop loin pour capter toutes les voix, renforcent l’immersion dans l’épopée wagnérienne. Même commentaire majoritairement positif pour L’or du Rhin (avec déjà un Wotan trop court décidément)… Siegfried (tendu et sec Heinz Kruse) et Le Crépuscule des dieux sont de loin les plus faibles; dans le Crépuscule: fausses bonnes idées de costumes inspirés de la Guerre des étoiles; lenteur statique de la mise en scène (malgré le dernier tableau où Brunnhilde ivre d’amour rejoint Siegfried, sur son cheval Grane en un embrasement rouge sang réalisé par une immense nappe de soie carmin… ); plateau vocal déséquilibré où seuls s’imposent la justesse vocale et jamais braillarde de Jeannine Altmeyer (Brünnhilde) et le convaincant Kurt Rydl (Hagen)… indiquent une réalisation qui a ses limites. Heureusement, l’orchestre gronde, s’agite, impose sous la feu directionnel du très habité Hartmut Haenchen, un chant impétueux et toujours passionnant. Le chef est le vrai artisan de cette Tétralogie aux arguments divers. Au final, voici une Tétralogie ambitieusement assumée avec un dispositif scénique original malgré ses partis visuels démodés; les enchaînements, la diversités des tableaux se réalisent sans trop d’aspérités; vocalement, la distribution reste trop moyenne pas assez investie d’autant que la direction de l’excellent Helmunt Haenchen à la fois épique et poétique, humaine et tragique, justifie largement l’achat de ce coffret wagnérien de 11 dvd.